Change of Seasons: Designing a Winter Landscape Plan with SLS Landscaping. Colder temps and shorter days are headed for South Jersey, but that doesn’t mean landscaping plans should be stored in the shed until the spring. While lush foliage isn’t at the fore, there are plenty of year-round projects perfect for the autumn and winter months. SLS Landscaping, Inc. of Lumberton is in the business of designing, building and maintaining incredible outdoor living spaces. They have been serving South Jersey since 1992, creating both residential and commercial exterior spaces customized to each owner’s specifications and dreams. 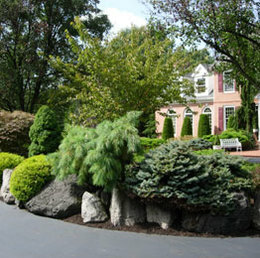 Their ultimate goal is to provide customers with an enjoyable, healthy and thriving landscape. During the fall, SLS works on continued hardscape installations, landscape maintenance, seasonal pruning needs, aeration, seeding and fertilizer applications, as well as fall leaf cleanup. But it is also a good time to look at your needs for next year and plan accordingly. As homeowners prepare for longer evenings in the winter months, landscape lighting projects become more in demand. King and his family couldn’t be happier with the way they were treated. “I didn’t have to worry about a thing,” he says, adding he can’t wait to use the fire pit on cool nights with his kids this fall.